Joshua Tree National Park is located in southeastern California, about 2.5 hours from Los Angeles. A U.S. National Monument since 1936 it was declared a U.S. National Park in 1994. The park resides in the Mojave desert and the Colorado desert, and the landscape, the wildlife and geology are typical of a desert. It is named for the Joshua tree (Yucca brevifolia) forests native to the park. The name Joshua tree was given by a group of Mormon settlers who crossed the Mojave Desert in the mid-19th century. The tree’s unique shape reminded them of a Biblical story in which Joshua reaches his hands up to the sky in prayer. Joshua Tree is crisscrossed with hundreds of faults, and is a great place to see raw rocks and the effects of earthquakes. The famous San Andreas Fault bounds the south side of the park, and can be observed from Keys View. Joshua Tree National Park is perfect for a weekend. The west entrance is located five miles south of the junction of Highway 62 and Park Boulevard at Joshua Tree Village and is a great place to start your journey. If you have just a day, stick to the Park Boulevard, with plenty of exhibits on the road and relatively easy 1 to 2 mile, loop, nature hikes that branch from it. Stop as often as you can as each turn opens out into a landscape that is different. Hidden Valley trail is a must do nature walk. Continue along Park Boulevard and take the detour to Keys View. This popular destination, perched on the crest of the Little San Bernardino Mountains, provides panoramic views of the Coachella Valley and is well worth the 20-minute drive from Park Boulevard down Keys View Road. The lookout is wheelchair accessible, or take the .2-mile-loop trail up the ridge for especially nice views. Look for the shining surface of the Salton Sea, which is 230 feet below sea level, on the far left. Looking to the right, the Santa Rosa Mountains are behind Indio and, along with 10,800-foot San Jacinto Peak behind Palm Springs, form the high points of the Peninsular Ranges. Further right, the usually snow-covered peak of 11,500-foot San Gorgonio Mountain is clearly visible. The southwest side of the ridge drops nearly a mile in elevation into the Coachella Valley. The infamous San Andreas Fault, stretching 700 miles from the Gulf of California to the Mendocino Coast north of San Francisco, runs through the valley and can be seen below. On a really clear day, you might be able to see Signal Mountain in Mexico. Rejoin Park Boulevard and drive to Jumbo Rocks. The rock formations of Joshua Tree National Park were formed 100 million years ago from the cooling of magma beneath the surface. Groundwater is responsible for the erosion that created the spheres from rectangular blocks. These prominent outcrops are known as inselbergs or monadnocks. For those wishing to stretch their legs, a 1.7-mile nature trail begins either just across from the entrance to Jumbo Rocks Campground or inside the campground, across from the amphitheater and takes you to Skull Rock. The formation was created by rain drops accumulating in tiny depressions and eroding the granite. As more rock eroded, more water accumulated, leading to more erosion until, as time passed, two hollowed-out sockets formed and the rock began to resemble a skull, and it really does look like a skull. Legend holds they came to the oasis because a medicine man told them it was a good place to live and that they would have many boy babies. The medicine man instructed them to plant a palm tree each time a boy was born. In the first year, the Serrano planted 29 palm trees at the oasis. The palms also provided the Serrano with food, clothing, cooking implements, and housing. After a day at the desert, the sight of water, palm trees, pomegranates and grapes are a perfect way to end the visit. Joshua Tree National Park is not one of the biggest parks in the U.S but is definitely one of the strangest. It is well a worth a visit if in California or Arizona. 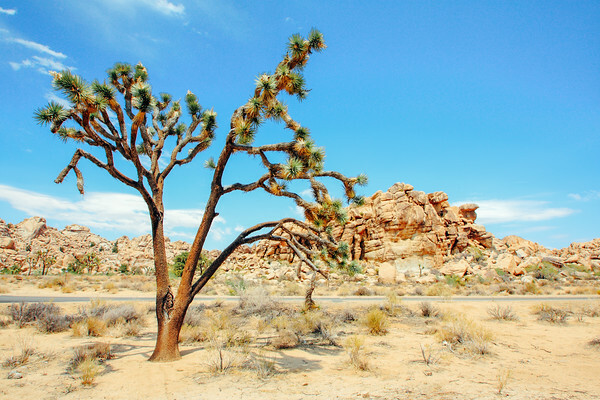 Take basic precautions like lots of water, sun screen lotion, comfortable shoes, and a wide brimmed hat and step out into the alien landscape of Joshua Tree National Park.